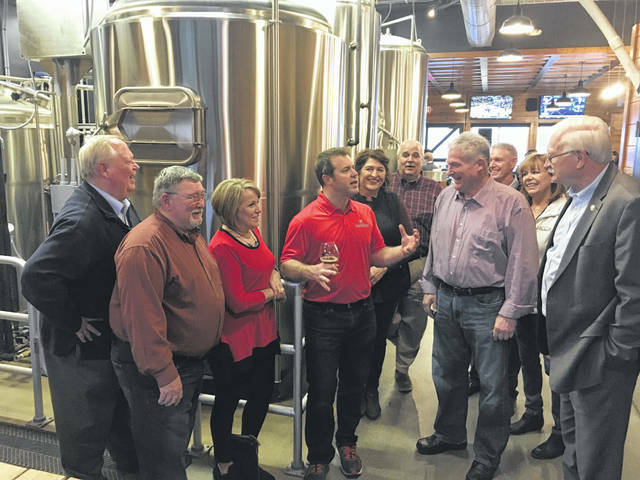 Members of the Shelby County Bicentennial Beer Subcommittee listen as Moeller Brew Barn Brew Master Nick Moeller, fourth from left, talks about the brewing process Friday, Jan. 25. MARIA STEIN — The Shelby County Bicentennial Beer Subcommittee sampled Moeller Brew Barn beers in Maria Stein Friday evening to prepare for the specially crafted beer to be brewed for Shelby County’s upcoming bicentennial celebration. The membership swelled as subcommittee members and numerous guests traveled to the brewery, met Brew Master Nick Moeller and toured his facility, which is currently being expanded. The bicentennial beer is planned to be a pilsner. Pilsner is a type of pale lager. It takes its name from the Czech city of Pilsen, where it was first produced in 1842. Shelby County Commissioner Tony Bornhorst, who chairs the Shelby County Bicentennial Beer Subcommittee, issued the invitation at the December meeting of the Shelby County Bicentennial Committee. Accepting the invitation were Shelby County Bicentennial Committee Chair Mike Barhorst, Bicentennial Committee Co-Chair and Shelby County Commissioner Bob Guillozet and his wife Bonnie, committee member and Sidney Municipal Court Judge Duane Goettemoeller and his wife Melanie, committee member and Shelby County Treasurer John Coffield, committee member and Sidney-Shelby County Chamber of Commerce President Jeff Raible and his wife Ronni, and committee member Eric Ditmer and his wife Teresa. Bornhorst’s wife Joyce was also in attendance. The contest deadline to name the Bicentennial Beer is near, on Friday, Feb. 15. The deadline provides time for the selection of the winning entry, notification of the winner, design of the label for the cans, and the packaging of the beer for sale. It is anticipated the beer will be available at local grocers, restaurants and bars — hopefully by April 1. A special printable contest entry form is available online at www.shelby-sidneybicentennial.com. Those wishing to submit entries should place one proposed name on each form along with their name, address and contact information and mail their submission to the Shelby County Commissioners office to 129 E. Court St., Sidney, OH 45365. Submissions can only be accepted from those 21 years of age or older. The entry selected will receive the first case of beer brewed and a check in the amount of $250. Located in Maria Stein, Moeller Brew Barn produces a number of craft beers. Those beers include Dirt Track Kolsch, Frogtown IPA, Moweizen, Wally Post Red, Hoppy Heff, Hazy Mae Ekuanot, Marzen Oktoberfest, Honeywagon IPA, Blackberry Prairie Wheat, Baked Oatmeal Stout, Dunkel Weizen, and Sawcreek Pale.